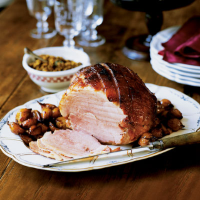 Star anise adds a wonderful flavour to the gammon and gives off a spicy aroma as it simmers. Hoi-sin with honey is a very tasty alternative to a traditional gammon glaze and gives a perfect sticky caramelized coating to the meat. The gammon will keep for up to 3 days in the fridge, in clingfilm. 1. Place the gammon in a large pan, keeping the string on to hold the joint together. Add the onion, carrots, celery, cardamom pods, chilli, bay leaf and star anise. Cover with cold water, bring slowly to the boil then put on the lid. Simmer for 30 minutes per 500g, adding boiling water from the kettle as needed. 2. Allow the gammon to cool slightly for half an hour in the cooking liquid then place on a board. Reserve the stock and pat the joint dry with kitchen paper. Carefully remove the string, peel away and discard the skin, leaving a layer of fat underneath. 3. Preheat the oven to 220°C, Gas mark 7 and place the gammon in a roasting tin. Using the tip of a knife, score the fat with parallel lines, first in one direction, then another to form diamonds. Mix the glaze ingredients to form a thick paste, and spread over the joint. Roast the joint for 20-25 minutes until evenly browned. Rest the joint for about 10 minutes before carving into thin slices.